Seems like there are not many "streamers" in the GWJ community. I have a roku and an HTPC so it is probably not something I need, but at $35 I may just grab one to play with. I'm thinking about one for the bedroom and possibly hotel rooms when I travel. However, I haven't really looked into how they'd work with the typical hotel room internet stuff. Might also require a travel router to make it easy. Right now I'm just putting a cheap 25 ft HDMI cable in the bag. We just cut the cord again and have one ordered. I'm very curious how these work out. We're replacing the TV this Fall and my girlfriend wants to put the current TV in the bedroom so she can watch stuff there. We were thinking of buying a Boxee or a streaming capable Blu-ray player for it but this might be a great alternative for less money. You still have to stream from a computer though. I'd rather have an AppleTV, since that can operate standalone, but if you aren't an Apple person this seems like a decent alternative. You can also stream from smartphones and tablets. That said, this doesn't seem to do much my Roku can't in my home environment, so I have my eye on it as a neat piece of technology but not as something that at present seems very useful to me. Anything using Chrome. And once you start supported services (not just a tab), the Chromecast handles the network streaming itself directly so it's not really reliant on the device that started the stream as I understand it for anything more than remote duties. So if you have an old phone, that could be your remote. No, this isn't going to be as full featured as a Roku or an Apple TV. But as cheap as it is, once the number of streaming services supporting it gets robust enough, it's a nice portable way to do streaming for dirt cheap. My problem is that philosophically, this is another locked down streaming tech. Not open stuff like DLNA or Miracast, that I would really like to see get improved to the point of near universal functionality. But since about everything runs Chrome, and this is so cheap, I can probably overcome my desire to stick with more universal solutions. Maybe you could put similar money into a Raspberry Pi as a travel streamer. It requires a bit more work but is open. And from what I've read, the processor is barely up to snuff on HD video, and struggles at times. And probably won't be as easy to get working with streaming services like HBO Go, Xfinity, etc. I keep thinking about getting a Pi, but think it would probably be pretty finicky for an on the road thing. It's not that, it's the absolute PITA it is to get Netflix to work on Raspberry Pi hardware, thanks to Silverlight and Linux hating each other. Until Netflix switches to HTML 5 or there's a solid, useful Android software build for Rasberry Pi, I'm probably going to use this solely for Netflix. I'll probably get mine as soon as I can get someone to go to the US. I'll say; I've been trying to engage the community in the Stream Anything thread, but response is tepid at best. The Plex community in general seems very excited and most comments are positive. As I posted in the Plex forums; I'm interested to see how Chromecast + Chrome + SplashTop or Google Remote Desktop could allow me to stream Steam Big Screen from a remote computer without building a separate PC for the living room. The controller would be an issue, but USB-to-go on the Android tablet that is running SplashTop could fix that. To be fair, Hobbes, your problem is the sort that's easiest solved by just putting hardware in the right place. Unfortunately Chromecast is not available in Europe yet, and as usual no release date is given. I would buy it just to be able to stream my Google Music to my receiver. I want to be able to hit Instant Mix when having friends over and be done with it. Can anyone confirm that the Chromecast works by plugging it into a HDMI port on a receiver? I found no official confirmation, just some rumours on the webs that it does in fact work. I doubt that it will automatically switch the TV input to itself, but it's still just an HDMI input. Wow, was that thing easy to setup. I didn't even go to a computer. Just downloaded the chromecast app on the phone and got it setup. Seems to work well for it's intended purpose, turning a dumb tv into a smart tv. Only thing I find a little concerning is the temperature this thing seems to just maintain. Seems to work well for it's intended purpose, turning a dumb tv into a smart tv. This is why I can't see myself getting one; I already have a smart tv with apps for Netflix, Amazon Prime video, Hulu + and, Pandora. The only app I wish it had was Amazon Cloud player, so I could stream my music from the TV. I have a wii one one dumb TV and a ps3 on another but I'm a gadget geek and need it because it's from Google. I see myself using it when traveling to places with dumb tvs. and just for the cool factor. I can't wait to see what the development community comes up with for it. I have been using an apple TV for this over the past few years but as many of the devices in our house start to move over to android I'm planning to get one of these when they are available here. I agree; I'm over-thinking and over-complicating things. not to derail the thread too much; but sending HDMI signal from one end of the house to another has been challenging. 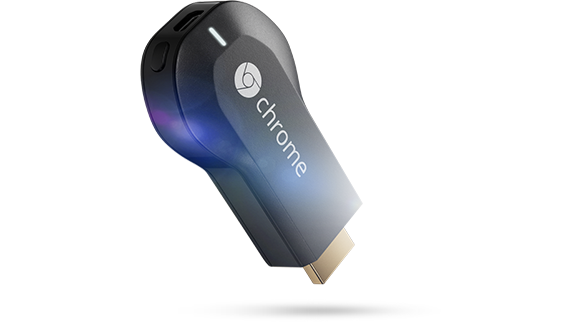 Streaming locally will save me lots of $$$, considering Chromecast is going for $35.00, while throwing HDMI signal is limited by distance and HDMI repeaters are going for around $200.00. I can move hardware around, but streaming over IP makes a lot of sense for what I need at home. I'll post again once I actually have a Chromecast and give my impressions. Maybe because the big thread around here is the I dumped cable TV... thread. Sigh, delivery date now between October 18 and Nov 6. This is exactly how I use it. It's plugged into my A/V receiver, and I blast Google Music through it. So, in theory, I could launch Showtime Anytime in Chrome on my Mac and Chromecast would pick it up automatically? That depends on whether "Cast this Tab" extension is available for the Mac version of Chrome or not. So does this require it's own app from a phone or computer or will it run from a browser? And if it runs from a browser, will it only work with Chrome? Yeah, think I might go with a Roku instead. Anyone have opinions about the different flavors of that device, is the 3 worth a hundred bucks? I have a Roku 2 XS ($80 new or $60 refurbished) that's roughly feature equivalent to the Roku 3, and I'm really pleased with it. It doesn't look like the 2 XS is a model that Roku is listing on their site any longer, although it's still supported and still receives all the latest updates. If you prefer newer and shinier, I can't imagine that the 3 was a step back from the 2 XS in any way. Rather than your Android device streaming to the Chromecast dongle; the Chromecast dongle will reach out directly to Netflix, using your Netflix credentials and start streaming what the Netflix app on your Android device instructed. In the case for Chrome browsers; you download the extension, and in this scenario, the browser will stream whatever is on the tab to the Chromecast dongle; for example Netflix. I imagine Google would release the extension for FireFox as well; seeing this as an opportunity to reach out and get some converts. some apps rumored that will include Chromecast in future updates.